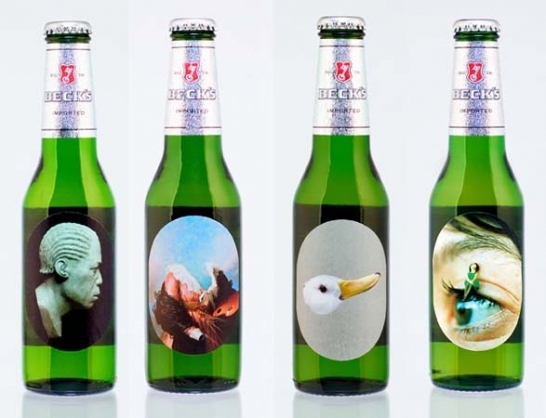 “From 1st August until Christmas, bottles of Beck’s beer will be adorned with the work of four emerging artists – thanks to a new scheme called Beck’s Canvas, a collaboration between the German brewery and London’s Royal College of Art. The RCA asked their graduates and students to submit work on the theme of individuality specially for this project and a jury of RCA artists selected the winning artists: Rita Ikonen, Tom Price, Charlotte Bracegirdle and Simon Cunningham. This is very interesting considering the amount of everage bottles we have seen recently become a great medium of art which is catching a lot of attention, with the likes of Mountain Dew and Coca Cola.